New Delhi: The story of how the government’s auditor arrived at its ₹ 1.76 trillion loss figure in the so-called 2G (second-generation) scam and how the report featuring this number was prepared becomes curiouser and curiouser. Internal documents of the Comptroller and Auditor General of India (CAG) viewed by Mint indicate that R.P. Singh, director general (post and telecommunications) at CAG, and the man who signed off on the body’s report on the issue didn’t actually have a hand in compiling the final report. Instead, he was asked to sign off on a report prepared by CAG headquarters. Mint reported in a 6 September story, based on internal CAG documents, that Singh had articulated the impossibility of quantifying losses arising from the allegedly irregular allotment of licences and spectrum to some telcos in 2008. The story added that he had been asked to send his draft report, with several alternative methodologies, none of which he was satisfied with, of calculating the losses. “It may not have violated the norms as the CAG (comptroller and auditor general, as the individual heading CAG is also designated) is entitled to his rights. (But) only if the officer is incompetent or something like that, does CAG HQ (headquarters) need to do the audit, but it is rarely been done. And normally, CAG will look at the report only at the last and final stage," said A.K. Thakur, former deputy comptroller and auditor general. A CAG spokesperson didn’t respond to multiple phone calls and an email seeking comment. 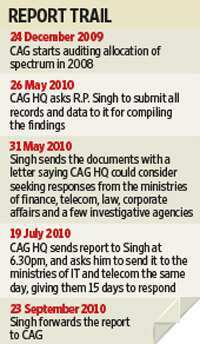 While CAG’s intervention and desire to hasten the process may have also been prompted by the amount of time being taken by the team originally asked to audit the 2G spectrum allotment process and the losses arising from this, the haste shown in preparing the final report meant that government departments involved, which should have been given six weeks to respond to the draft audit, were given only two. And the auditor also seemed to think that the response from the department of telecommunications (DoT) to the draft audit, muddied the waters instead of clarifying them. “I wish we had not written to DoT", comptroller and auditor general Vinod Rai wrote on the note from Singh forwarding DoT’s reply, according to a file noting reviewed by Mint. Sure enough, DoT’s response on some of the issues raised in the CAG draft report does not seem to have been taken into account in the final report. For instance, the CAG report tabled in Parliament said granting a dual-technology licence to existing telcos (allowing, in the process, telcos with licences to offer services on the CDMA technology platform to do so on the dominant GSM technology platform, too) “lacked transparency and fairness". This came despite Singh writing in his note, after receiving DoT’s reply, that “the issues raised in the draft report were already addressed by Telecom Disputes Settlement and Appellate Tribunal, and the court in their judgement of March 2009 had observed no omission or malafide on the part of DoT in granting of spectrum for dual technology to certain companies". To be sure, CAG does seem to have taken DoT’s views into account in some instances. A spokesperson for Tata Teleservices declined comment. In its final report, CAG listed four figures as possible presumptive (or notional) losses arising from the way the government chose to allot spectrum to companies in 2008: ₹ 67,364 crore, ₹ 57,666 crore, ₹ 69,626 crore and ₹ 1.76 trillion. The first was based on an offer made by telecom operator STel Pvt. Ltd in a letter to the Prime Minister for a pan-India licence; the second and the third, a range, on the sale of equity by Swan Telecom (now Etisalat DB Telecom India Pvt. Ltd) and Unitech Wireless Ltd; and the fourth on the price at which third-generation spectrum was auctioned.